The Humungous is arguably one of the most consistent flies for big fish at FRY time. Definitely a favourite for Rutlands, Grafhams and Pitsfords Large Browns. Although prolific during the fry months, they work all year round! They will catch the smaller trout but these are a recognised food source of the residents! 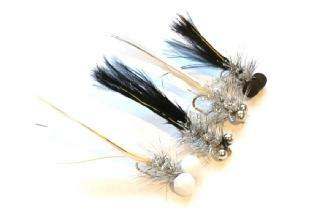 Tied on size 8 strong lure hooks these won't let you down. The fish can be particular with one colour with White working one day and then prefer the black the next so keep alternating to find the best colour on the day. The Boobys can be pulled across the surface for explosive action or fished deep and slow on sinking lines. Iain Barr Tip - Try fishing all speeds, even fig of 8 on a floating line. Use a booby on the point with a lure on the dropper on a Di3. A favourite method of mine with opposite colours on.